Music lovers have the rare chance to hear China's national anthem and The Star Spangled Banner played together at an orchestral concert. Dr Bruce Ammann, from Chicago, will lead his Augustana concert band in performing both national anthems as the orchestra tours China this month. After its Beijing concert at the Beijing Concert Hall on January 14, the troupe will tour Xi'an, Nanjing, Suzhou, Shanghai and Hong Kong. Founded more than 30 years ago, Augustana is considered one of the most active university orchestras in the United States. It has performed at some of the most important music festivals in the world. This is the third time it has performed in China. Ammann, the soul of the band, is in his 14th year as Director of Bands and Professor of Music at Augustana. He is also the conductor of the Dakota Symphony Orchestra. 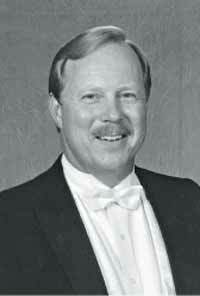 In 1996, Ammann was elected as a member of the American Bandmasters Association. In 1997, he received the Phi Beta Mu "Outstanding Bandmaster Award" for the state of South Dakota. In 2001, he won the Vernon and Mildred Niebuhr Faculty Excellence Award, the highest award ever presented to an Augustana faculty member. The orchestra will perform their classic repertoire like Rolling Thunder, Liberty Fanfare, Phantom of the Opera and Les Miserables.